Brisket leftovers, reheated another day, are terrific. 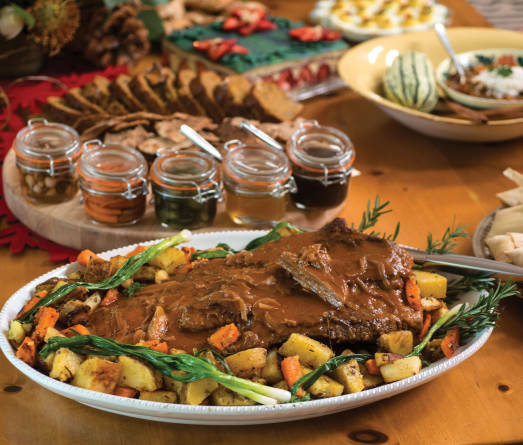 Martín roasted root vegetables— carrots, parsnips, turnips—and small potatoes in olive oil in another shallow pan and added them to the platter with the brisket and sauce. Sprinkle brisket on both sides with 2 teaspoons each of salt and pepper. Let brisket stand at room temperature for about 30 minutes. Warm oil in large roasting pan on the stovetop over medium heat. Scatter onions in roasting pan and stir to cover in oil. Cook for 5 minutes, until onions have begun to wilt. Reduce heat to medium-low and continue cooking for about 30 minutes, until onions are reduced and light brown. Scrape onions onto a plate or into a bowl and return roasting pan to stovetop. Raise heat to high and add brisket, fattier side down. Sear brisket until medium brown, 8–10 minutes. Turn brisket over carefully with tongs and a spatula, and continue searing until second side is medium brown, 8–10 minutes more. Remove from heat. Spoon onions and any juices evenly over brisket, then add red wine and ketchup. Cover the pan tightly with foil. Transfer brisket to oven and bake about 1 hour per pound. After about 5 hours, remove the foil and continue cooking until brisket is fork tender. Remove brisket to a platter. Place roasting pan back over stovetop. Over medium heat, reduce pan juices to gravy-like thickness and degrease, if you wish. Pour over and around brisket. Serve warm, sliced across the grain.